This set of Organic Chemistry Questions and Answers for Aptitude test focuses on “Claisen and Cross Claisen Condensation”. 1. Which of the following reaction shows Claisen condensation? Explanation: The Claisen condensation is a carbon–carbon bond forming reaction that occurs between two esters or one ester and another carbonyl compound in the presence of a strong base, resulting in a β-keto ester or a β-diketone. 2. Which ester will not give a good yield of the Claisen condensation product with NaOEt in EtOH? Explanation: The Claisen condensation is reversible and it is formation of a stabilized enolate of the product which leads to a high yield at equilibrium. When the product cannot give a stabilized enolate, the yield will be poor. 3. Which of the following is a product formed in Claisen condensation? 4. Which of the following stamen is incorrect about Claisen condensation? Explanation: The product is a β-keto ester which gets deprotonated by the strong base in the reaction mixture and get converted into simple keto group. 5. What will be the product of the following reaction? Explanation: The Claisen Condensation between esters containing α-hydrogens, promoted by a base such as sodium ethoxide, affords β-keto esters. 6. What will be the product of the following reaction? 7. What will be the product of the following reaction? Explanation: If one of the ester partners has enolizable α-hydrogens and the other does not (e.g., aromatic esters or carbonates), this will be the mixed reaction or cross Claisen condensation. 8. What will be the product of the following reaction? 9.	which of the following is the reactant precursor for the given product? Explanation: In Claisen condensation, the driving force is the formation of the stabilized anion of the β-keto ester. If two different esters are used, an essentially statistical mixture of all four products is generally obtained, and the preparation does not have high synthetic utility. 10. 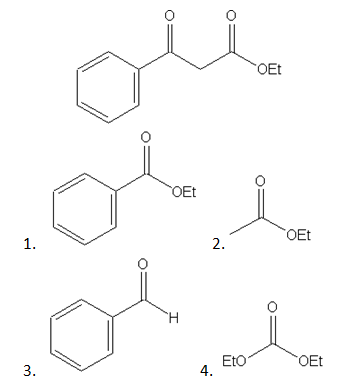 Which of the following mechanism shows the correct curve arrow of the reaction of the enolate ion from ethyl acetate with ethyl acetate in the Claisen condensation? Explanation: Mechanism of Claisen condensation consist of main three steps. First, an acid-base reaction. The alkoxide functions as a base and removes the acidic a-hydrogen giving the reactive ester enolate. The nucleophilic ester enolate attacks the carbonyl C of another ester in a nucleophilic substitution process giving the tetrahedral intermediate. The intermediate collapses, reforming the C=O, resulting in loss of the leaving group, the alkoxide, leading to the b-ketoester product. 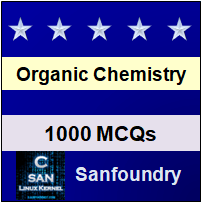 To practice all areas of Organic Chemistry for Aptitude test, here is complete set of 1000+ Multiple Choice Questions and Answers.